Alright the biggest, most anticpated night of all-time-in-the-universe has come and gone, and what is the verdict?? Not impressed....for someone like me who dedicates 6 hours of my day to watching the pre-show to the pre-show to the pre-redcarpet before the actual show, I expect to be blown away by fashion and entertainment "moments". Last night was lacking in both departments; thank God for Charlize. Seth MacFarlane was good, but he was no Ricky Gervais or TinaFey/AmyPhoeler. Now I wish I would've spent that time finishing Season 3 of Downtown Abbey. (Obsessed with the Crawleys and their moments of crisis about missing silverware). Anyway, the fashion was mostly safe, the days of major risk-taking are gone, the stars seem too closely handled and their image to carefully cultivated by a team of publicists, managers, agents who probably provide strict parameters to the stylists on what "look" they're going for. This lends itself to very minimal risk-taking when it comes to fashion choices. Where is the drama?? Can someone please bring the drama! The best part of red carpets are when stars create fashion "moments" - these go down in fashion history and remain in our collective memory for years! I still remember the days when Nicole Kidman was the queen of the red carpet, like her beautiful Chanel gown in 2004 or the gorgeous Balenciaga red from 2007 or the Gucci peacock she wore to the Golden Globes in 2005. Gwyneth Paltrow is another red carpet moment creator,as she showed us in her Tom Ford cape glory from last year. These are the types of fashion moments I look for. Last night, Charlize was the only one who brought her A-game but many say that she could wear a garbage bin and she'd look stunning, I may have to agree. I actually contemplated naming the two lists "Charlize" and "Other". She has been a consistent favourite of mine, mostly because she can't be human. You can see my previous Charlize adulation here for example. Alright so here we go; here are my favs and not-so-much picks from the 2013 Academy Awards. 5) Kerry Washington has been appearing on this side of the list for much of the awards season and her contract with fashion house Miu Miu is serving her well. This dress was equal parts glamour and unique, the colour made her stand out with just the right amount of bling on the bodice. Now I just hope she starts eating again! 4) Halle Berry wanted to look like a Bond girl last night and the team at Versace custom made this gown with those instructions in mind. At first on TV I didn't love this dress but seeing it in pictures, it quickly became a Best-dressed contender. Bravo Halle! 3) Naomi Watts wins for second runner-up. She's in Armani Prive and this is a great example of how the right cut and structure done well can really be stunning. And she's a mom as well, Jenn Garner! 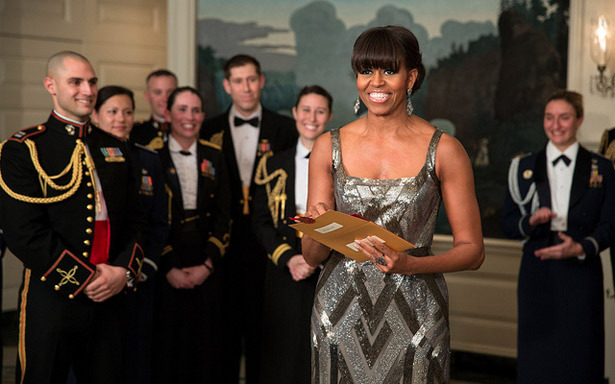 2) Michelle Obama surprised everyone by appearing in this gorgeous Naeem Khan gown, with her meticulously styled bangs (props!) to announce the most important award of the night; Best Picture. She Skyped in (or whatever) and really blew most of the fashion competition away! I love her classic yet glamorous style, definitely a fashion icon who we'll be talking about for years to come, what a treat. (take that Laura Bush!). 1) And the best-dressed award goes to....Charlize! (#obvi) What I love most about this look is her amazing hair, with the statement the hair made, she didn't need to do much with this Dior Couture gown and accessories. Too many competing elements is a sign of bad styling - so this really is a perfect example of restrain and edited styling. Absolutely flawless. 5) Many fashion people on my twitter feed (as I was insane enought to live-tweet the Oscars last night) loved this look on Zoe Saldana. I think it was because she chose a lesser known French designer Alexis Mabille. The fit, cut and colour are great but I personally didn't like the competing elements of the Dollar Store fake flowers with the belt...and then the 50 shades of grey below (see what I did there ;) ;) too many things going on. 3) Alright Kristen Stewart, we know you're over it, we know you don't care to brush your hair, we know you broke a leg jumping off a rooftop at a hipster house party at 5am (just guessing) - we get it. You're SO OVER IT. So let me ask then, why wear Reem Acra?? Why put on a lacey, beady pale-beigey dress by a mostly bridal designer? And then why add unwashed hair and smudged eye-liner? If you truly don't care, then whats with all the frills? Just go all badass in Tom Ford or something truly rebellious...oh kids these days, they don't really get the existential angst thing do they? 1) And the worst-dressed title goes to: Anne Hathaway. She actually gets the title for worst acceptance speech as well. Did you watch it? She mentioned something about how her role as Fantine in Les Mis and ending world poverty are connected....really Miss Teen USA 1998? 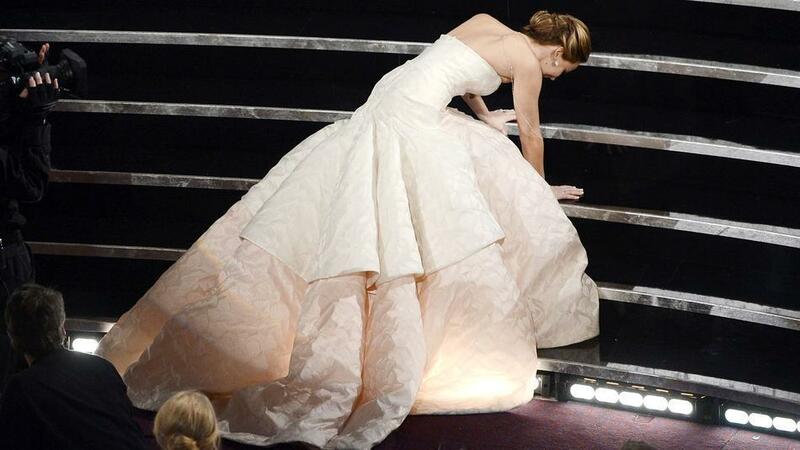 She is an amazing actress but for one of the most highly anticpated celebrities on the red carpet, she let us down. I actually really liked the Prada dress, I like the colour, cut and I like the back, this dress at the SAG awards would've been perfect but not at the Oscars. And there are two very "distracting elements" that ruin it; making it a poorly fitted dress.